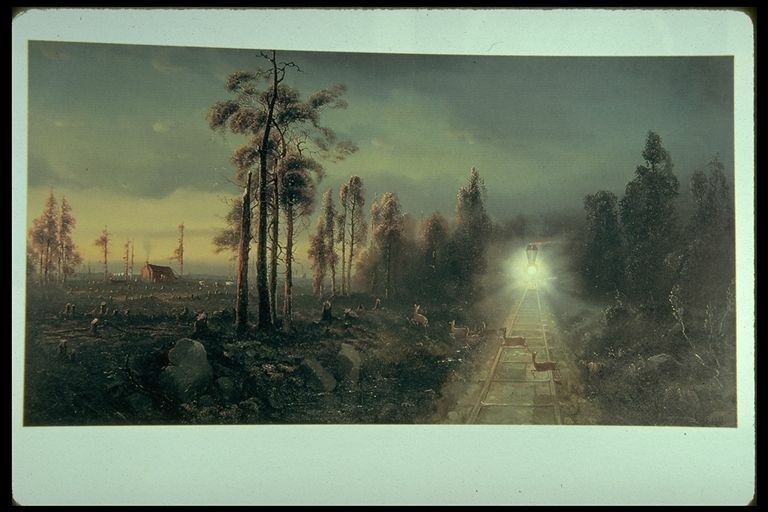 In Melrose's painting, "Westward the Star of Empire takes its way," the railroad disrupts nature and bears down on the viewer, with the locomotive's light shining like a jewel. Wild deer scatter to the left, but the cleared field offers no refuge--the stumps, that catch the light of the west-setting sun, and the still sunlit cabin, are a sign of progress. Sectional rivalries between North and South had prevented the construction of transcontinental railroads before the Civil War. By the time Melrose (who never seems to have travelled in the west) painted this picture, the expansionist impulse, which had been diversely expressed in the 1840's, was becoming embodied in the eastward and westward reaching lines of the Union Pacific and Central Pacific railways, which were to meet May 10, 1869. Melrose's painting captures the impetuosity and inevitability of America's continent spanning energy. (see Patricia Hills, "Picturing Progress in the Era of Westward Expansion," in THE WEST AS AMERICA: REINTERPRETING IMAGES OF THE FRONTIER, Washington and London: Smithsonian Institution Press, 1991, pp. 97-147).